Two North Carolina electric cooperatives recently received a total of more than $27 million in funding for rural electric infrastructure improvements from the U.S. Department of Agriculture. The loans will help the co-ops maintain and strengthen their systems, as well as contribute to job creation and economic development in rural North Carolina. 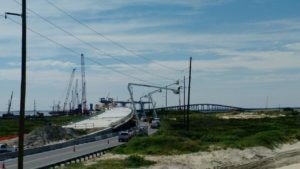 Cape Hatteras Electric Cooperative, based in Buxton, was awarded nearly $7.6 million for improvements associated with construction of the new Bonner Bridge on the state’s Outer Banks. The funding will be used to install a new 115kV transmission line on the new bridge, as well as install a station service transformer. The cooperative serves 7,700 consumers over 347 miles of line in Dare County. The region is also a significant tourist destination. Construction is underway on the new Bonner Bridge. Rutherford EMC, based in Forest City, received $20 million to build 112 miles of line and make other system improvements. The cooperative serves more than 68,000 consumers over more than 7,200 miles of existing line in Burke, Caldwell, Catawba, Cleveland, Gaston, Lincoln, McDowell, Mitchell, Polk and Rutherford counties in western North Carolina. These two North Carolina-based loans are part of a nationwide investment of $309 million in 16 projects to improve rural electric infrastructure in 12 states. The loans are made through USDA’s Electric Infrastructure Loan and Loan Guarantee program, which helps finance generation, transmission and distribution projects; system improvements; and energy conservation projects in communities with 10,000 or fewer residents.